This oldest part of the Cathedral that you see today is more than a thousand years old. But the events that gave rise to it go back long before, to the very time of Jesus’ death. It all began when one of the most important apostles, St. James the Greater, was executed in Palestine in the year 44. His followers decided to bury him far from there and set off on a journey to the End of the World. You can read here about how the apostle was brought to Galicia. It is really amazing! As a result of this miraculous journey, the apostle was buried on a magical hill called Libredón. His tomb was forgotten… until one night 1,200 years ago when it was discovered. The king realised that it contained the relics of one of Jesus’ apostles and ordered a church to be built; the next king, a bigger one… but they always proved to be too small because lots of pilgrims started coming after hearing about the miracle. 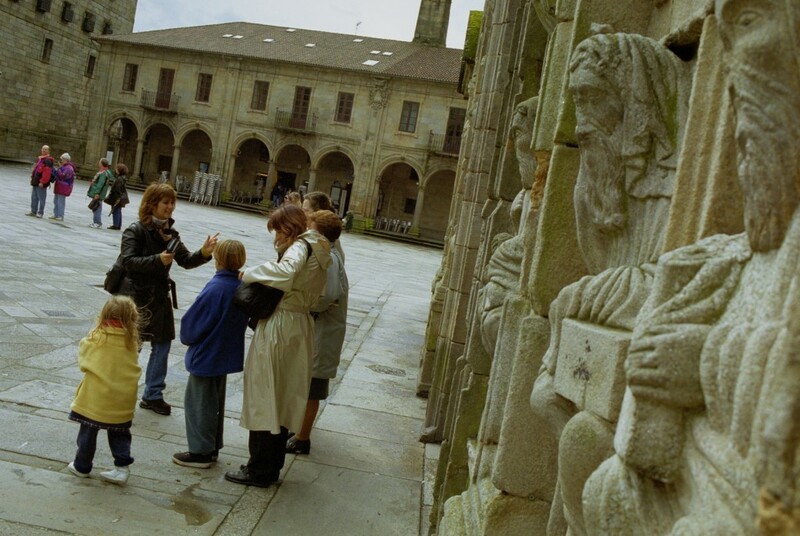 Monks, merchants and peasants came, and Compostela began to grow in the 10th century. And that brings us to the year 1075, when the first stones of the grand pilgrimage Cathedral we see today were finally laid. From that year onwards, the best builders of the Romanesque period would come to Santiago, including Maestro Mateo, who designed the final sections of the naves, especially the “Pórtico de la Gloria,” the jewel that dominates the west entrance. By the time it was dedicated in the year 1211, the Cathedral already enjoyed an incredible privilege: everyone visiting the Cathedral during a Holy Year would receive forgiveness for their sins. And that was very important in the Middle Ages! In time, construction work continued on the Cathedral. Santiago was a city rich in properties and could afford to have the most beautiful church for the apostle, who was named the patron saint of Spain in 1630. Chapels were gradually added and changed, and the altarpieces enriched. In the times of Gothic art, the Cathedral was disguised like a fort with towers and battlements. But the greatest revolution came with the baroque period, the elegant style that we now see in the high altar, the Obradoiro façade and in the monumental squares surrounding the Cathedral. You will notice it by its stone volutes, its strings of flowers and fruits, its geometric patterns in the hard granite, spiky cornices full of pinnacles, its sturdy chimneys and its stylised towers… Santiago is very, very baroque! In short, this is a thousand-year-old Cathedral, with a very rich story. Here kings and archbishops have been crowned; fires and battles have occurred; invading soldiers have been garrisoned, and millions of men and women from all parts of the world have knelt down. The Cathedral is the heart of the city of Santiago’s history. And with a bit of imagination, you can read all of these marvellous events in the stone. Why is the Cathedral of Santiago special?